My wife and I often host Tot-Tails, a neighborhood party where all parents with tots gather to have cocktails while our kids play with one another. It’s a fun time, but at the end of these evenings, we often have parents who are not in great shape for the bedtime routine that will follow, especially since many of the tots have consumed a greater-than-recommended amount of sugar. We hosted such a party on New Year’s Eve. At the end of the night, most of the kids were in whirling-dervish mode, hopped up on artificial sweeteners and flying through our house at warp speed. As host, I felt responsible to quiet them before sending them home to bed, so I invited all the kids to sit on the floor in our living room and play a game with me. The winner is the person who throws the least fingers that is not thrown by anyone else. For example, if two players throw 3 fingers, they cancel each other out, and a third player who throws 5 fingers would win. A round of Low-Sham-Bow. 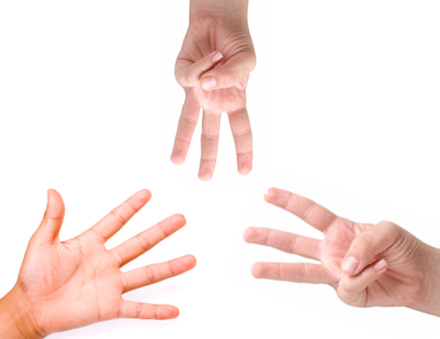 The player who threw 5 fingers wins, because the two players who threw 3 fingers cancel each other out. You may recognize this game as a variation of My Favorite Game, with the difference being that this game limits the user input to numbers 0‑5. Folks who play Ultimate Frisbee use the alternative name Rochambeau (or Roshambo, or Row-Sham-Bow) for the game of Rock-Paper-Scissors. Similarly, my sons and I call this game Low-Sham-Bow, since a low throw wins. I find Low-Sham-Bow to be preferable to Rock-Paper-Scissors when one person needs to be chosen from a large group. Rock-Paper-Scissors is a two-player game, so it’s a good game for couples to use when they disagree on where to have dinner; but Low-Sham-Bow can be played by any number of folks, so it’ a good game when five siblings are trying to decide who gets the last cookie in the jar. So, the kids and I sat down to play the game. The first round, five-year-old Stephen threw 2 fingers, while every other kid threw 0 fingers. I congratulated Stephen on his win, and I gave him a quarter. This got the other kids’ attention. The game served its intended purpose. By the end, all kids were reasonably calm, and the parents seemed to be grateful for my efforts. As folks started filing out, four-year-old Leo showed me his quarter. “I got this for winning a game,” he said.